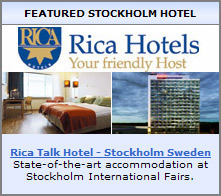 Book your online reservation directly with top hotels in Stockholm Sweden - from two star, economy, budget, child & family friendly lodging, first class accommodations to superior hoteles, deluxe luxury hotels and resorts. Find downtown Stockholm hotels, midtown, business district or airport hotels using our search engine, and find the best hotels in the Stockholm area for your next family vacation, romantic weekend getaways, holiday, or business trip. Ever since 1810, functional comfort has called Villa Kallhagen home. With humble beginnings as a quaint cottage, the site is now one of Stockholm, Sweden's best luxury boutique hotels. A unique blend of timeless charm, modern architecture and a relaxing ambience that could only be found in Sweden permeates every part of Villa Kallhagen's elegant facilities. Inspiring meeting spaces and 36 uniquely decorated rooms and suites are just the beginning of the modern, functional elegance. Located in Gardet by the Djurgarden canal, it's just a short, scenic walk from the excitement of Stockholm's city centre. A stay at Stockholm’s coolest boutique hotel is always unforgettable whether it’s for business or pleasure. As the official hotel of ABBA The Museum, Melody Hotel offers a unique experience because you get to stay just a few floors up. The vibrant atmosphere and warm hospitality welcome guests of all kinds to relax, work and dine in style. The hotel features the very latest in interior design and luxurious comfort, where 50 fashionable rooms, a chic restaurant and wine bar, and a modern gym await discerning travellers who expect nothing but the best. Just in front of the hotel entrance, guests can easily get the tram to the city centre. Welcome to one of the best-kept secrets in Stockholm. Located in a central city alley, Berns Hotel is a premium boutique hotel full of modern design. At the same time it is part of the legendary house of Berns dating back to 1863. Maybe it's the secret entrance that has made guests such as Rihanna, Bill Gates, Noomi Rapace and Dalai Lama pass through our doors. Or maybe it's the majestic breakfast hall with crystal chandeliers and mirrors. Either way, we look forward to offering you the excellent service we are known for. Berns Hotel also opens the doors to Stockholm's hottest nightlife. New hotel in Stockholm city center opening 12th of January 2015. Hotel Kungstradgarden – The King's Garden. This unique, family owned hotel will offer 98 individually decorated rooms in a classic Gustavian style, an extraordinary atrium restaurant and bar, gym and relaxation area and last but not the least - meeting and event facilities. We look forward to welcoming you as our future guest. Welcome to Hotel Kungstradgarden – The King's Garden your new residence in Stockholm! Welcome to Hotel Oden, the friendly hotel with the positive atmosphere and affordable prices! The hotel is centrally located at Odenplan, in close proximity to all communications. We offer a high degree of comfort and hospitality. The hotel usually accommodates both business travellers and tourists. We've let some interior and design students use their imagination and innovation to redesign some of our rooms here at the hotel. This means that each of these rooms now have their own unique theme. Welcome to meet and stay at the most beautiful location in Stockholm, in the area of Saltsjoqvarn, close to Danvikstull and the municipality of Nacka. Let yourself be seduced by the magnificent view over the inlet to Stockholm, where the city meets the archipelago. Experience open views over the green island Djurgarden and Waldemarsudde in central Stockholm. Arrange meetings in a hotel with perfect inspiring and relaxing surroundings. With closeness to downtown and highest level of service the Elite Hotel Marina Tower will offer a unique experience beyond all expectations. Elite Palace Hotel is a modern hotel located in downtown Stockholm. The hotel guests can enjoy the nearness to all city attractions while still in a peaceful environment near walking paths by the water. Nearby the hotel you will find many pubs, restaurants and cafes from all over the world. At the hotel you enjoy delicious meals in The British style pub Bishop's Arms, who invite you to exciting taste experiences, as it offers exclusive beer and whisky tastings. The Elite Hotel Stockholm Plaza is a beautiful hotel that was built in 1884. It is located only 100 meters from Stureplan, in central Stockholm. Here, you will stay in a relaxing oasis in a lively part of Stockholm with the best shopping streets, restaurants and attractions steps away. We offer our guests an atmosphere of personal and individual attention and the highest conceivable level of service. There is one thing on which we never compromise - personal service. The exclusive Elite Eden Park Hotel with the location right by the greenery of Humlegarden park and next door to the pulsating city life at Stureplan, is the fifth Elite hotel in Stockholm. Quality and service have always been first priority at Elite Hotels. The Eden Park hotel will add an extra dimension to that. The 124 rooms, designed with timeless elegance and ultimate comfort, are the perfect setting for rest and relaxation after either an exhausting day at work or during a weekend off. Our aim is to make every stay to an unique experience. Elite Hotel Adlon is situated on Vasagatan in central Stockholm. It is housed in a charming neoclassical building dating back to 1884 and now houses 100 hotel rooms, three conference rooms and a lounge which serves food and drinks. Across the street you will find Elite Hotels gastro pub The Bishops Arms. With walking distance to both the Central Station and Arlanda Express, it is the perfect location for your stay. Located on ostermalm in central Stockholm not far away from the legendary 1912 Olympic Stadium and the Royal institute of Technology you will find The Elite Hotel Arcadia. It is an elegant property from the late fifties where guests can enjoy a newly renovated hotel with a four star service. The underground station is situated close to the hotel and will take you to the Central railway station within five minutes. If you should choose to walk you will reach the Stureplan district with its shopping, museums, restaurants and the Stockholm nightlife in 15 minutes. Just 2 minutes walk from the Old Town the Hilton Stockholm Slussen hotel is set on Sodermalm Island. Look out over Riddarfjarden's calm waters as you sit by the fireplace in the Executive Lounge. Relax in the whirlpool or sauna work out in the gym or be pampered at the beauty clinic. Stallmastaregarden is Stockholm's oldest operating inn and offers a unique combination of modern design and beautiful historic style. Located just 10 minutes from the centre of Stockholm in the Royal Park of Haga by the bay of Brunnsviken, it features 49 graceful rooms, individually decorated with a touch of traditional 18th century charm plus the comforts and conveniences of a contemporary lifestyle. It offers an excellent restaurant for up to 55 guests and a grand banqueting venue where up to 200 people can gather for business or pleasure. This, together with its state-of-the-art conference facilities, makes Stallmastaregarden ideal for special events. The original Stallmastaregarden was built in 1645; the modern hotel wing opened in 2000, carefully designed to harmonise with the inns classic architecture and timeless ambiance. Today, Stallmastaregarden is a member of the Worldhotels First Class Collection and proudly continues its tradition of genuine hospitality. A warm and friendly oasis in the heart of Stockholm, the Hotel Anno 1647 is a Stockholm luxury hotel located near the metro, subway and main central station. The Hotel Anno 1647 blends beautiful 18th century interiors with modern functional design and personalized service to create an unforgettable stay. Comprised of two houses, the front house built in 1647 and the back house built in the middle of the 18th century, the Hotel Anno 1647 Stockholm boasts excellent meeting and conference facilities, as well as a restaurant and bar that take advantage of the hotel’s unique ambience. Including standard, budget, and business suites, the guest rooms at the Hotel Anno 1647 Stockholm include all the modern conveniences and an intimate, personal character, as well as stunning views over Stockholm’s old city. To find and reserve the perfect room at the Hotel Anno 1647 Stockholm, why not look at our rates and availability? Find hotels rooms, hotel booking, hotel deals, Stockholm hotel reservation, motels, hotels cheap, hotel reservations, Stockholm hotels deals, hotel offers, booking hotels and more! !